How to Participate in I Saw Sunday! 1. Write a blog post on your own site that tells or shows something you observed this week. Observations, Poetry, Story or Images. 2. Make sure to put a link somewhere in the post back to I Saw Sunday. If you need help just ask. 3. Come back here and put your name and the link to your blog post in the ‘Mr Linky’ widget. So we know where to find your post. 4. Leave a comment in the comment section. That way I get an email to let me know that you’ve been by. 5. Visit the blog of the other participants who have also left their name in the linky to share their I Saw Sunday entry. Don’t forget this important stage, it is good to share! 6. Come back and join in again next week! It will be great to see you again. 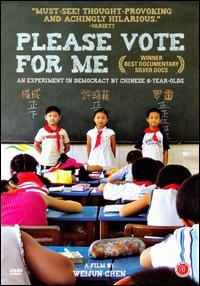 Please Vote for Me is a documentary on the first time a Chinese elementary school has an election for a class monitor. In China, from primary – tertiary school each class has a monitor, who leads, reprimands, organizes and if need be rats on his or her classmates. This role in a class and sometimes these children develop good leadership skills and sometimes they just flounder in their own disorganization. In any event, taking on the position looks good on a resume. The documentary maker hales from Wuhan and over time spoke to the school about making a film. So Evergreen Elementary School in Wuhan embarks on this democratic experiment with kids who have no idea what democracy is. It’s captivating to see the crooked roads the students often take urged on by their parents. There’s no smoked filled back rooms, but that’s not necessary to rig an election we soon see. The teachers select three candidates: one’s been Class Monitor for two terms already, then there’s a cute, rather docile girl and jocular, yet shrewd boy. In the lead up to voting the candidates must participate in a talent show and a debate or rather ad hominem attack contest, and give a final speech. More often than not, the race gets negative and kids start crying. Sometimes most of the class is in tears. What struck me was how the teacher just smiled through the drama never trying to teach a lesson in fairness or counsel a candidate to be more respectful. There really was no educational consequence for running a smear campaign. You will see who wins and I’ll just say it’s the kid I liked the least. I wondered why a school in one party China would attempt this. By the end I thought, this experiment is sure to cure anyone with a desire to make the country more democratic. By making an election, a painful childhood memory, few Chinese will choose that form of government when they’re older. If you don’t subscribe to Netflix, you can see the film on YouTube. Thanks very much for leaving your link at I Saw Sunday. This is quite bizarre! Wonderful inside view of what a child’s life in the world can be! Gemma, it’s amazing how even before the parents entered the picture, some of Cheng Cheng started his sly politics. He was a natural. I wonder what he’ll do when he grows up.